Sunday, January 28th, we boarded the Crown of Scandinavia bound for Danish capital Copenhagen. 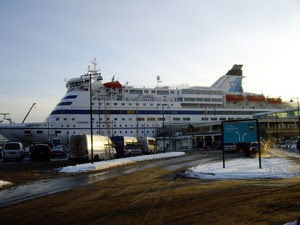 The DFDS operates a daily service from Oslo, and the passage takes 16 1/2 hours, leaving Oslo at 5 PM, arriving in Denmark 9.30 the following morning. The route took us out the Oslo Fjord, over the area where the Skagerak meets the Kattegat, along the eastern swedish coast down to the narrow Øresund separating the cities of Copenhagen and Malmø. The Crown of Scandinavia is one out of two motor ferries that operates this route. During the winter you can easily get very inexpensive tickets for the crossing, and you can even get tickets for free. We paid €20 each for a roundtrip ticket, including inside double cabin for two nights. You can, however, change the crossing into a luxurious minicruise if you order a Commodore cruise, including a large cabin, champagne, meals, but you have to pay up. This experience will cost you around €260, for each. On board you have have a large restaurant, a bistro, and a cafeteria, a nightclub and a disco and a cinema. There are shops where you can buy duty free goods, as Norway (regrettably) is not a member of the European Union. I will present some memories from our crossing, and tell you what to eat. You do not have to spend much to get a decent meal. Beware that the ferry company will try to take as many euros as possible out of your pocket, and an inexpensive ticket can turn into a very expensive experience if you drink and eat very much. So I will tell you where you can get value for money. Start you luxurious minicruise by buying a bottle of sparkling wine in the duty free shop. It will cost you €6 and you can get that little buzz for a nice price. Take breakfast in the cafe, this will cost you €5-6, the buffet cost more than the double price. And eat in Copenhagen!! It is a wonderful city to have a good breakfast and lunch. So I will give you some information the following days and join me for a trip to wonderful, wonderful Copenhagen! !